The ancient earthworks depicted above once lay along waters of the East Fork of the Little Miami River in Ohio, about 20 miles above its mouth near Milford, and about 25-30 miles east of Cincinnati. They have long since been plowed level, and their orientation and exact location are unknown. Ohio had dozens of such large-scale earthworks, attributed to the Hopewell Culture of circa 100 BC to 500 AD. However, most of them incorporated relatively simple geometrical structures, primarily circles, squares, octagons, and extended parallel walls. The East Fork Works are unusual for their complexity. The above map is a portion of one drawn in 1823 and attributed by Warden (1834) to Maj. Isaac Roberdeau, head of the Bureau of Topographical Engineers, U.S. Army Corps of Engineers. The complete original map, depicted below, is preserved in the Cartographic and Architectural Branch of the Military Archives Division of the U.S. National Archives in Alexandria, Va., Record Group 77 (U.S. Army Corps of Engineers, Fortifications File), drawer 144, sheet no. 20. The 5" scale at the lower left represents 2000 feet. 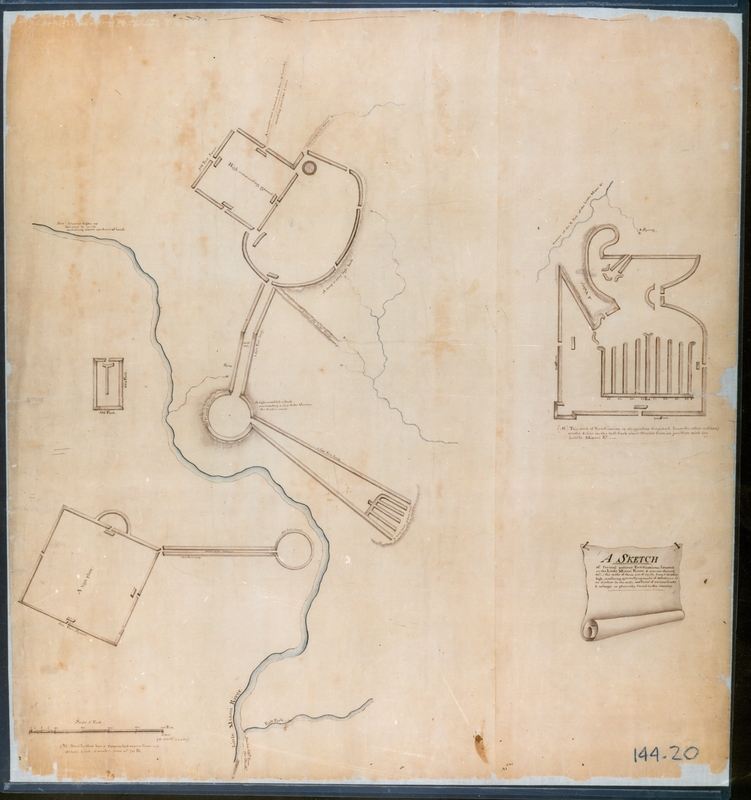 However, the map consists of two sheets of identical paper glued together, so it is not entirely clear whether this scale pertains only to the Milford Works on the left panel, or to the entire map, including the East Fork Works on the right panel. A less detailed survey of the same works depicted on the Roberdeau map, made circa 1803 by Gen. William Lytle of Cincinnati, had previously been published in Williamson's (1811) Observations on the Climate in Different Parts of America. Click here for 18MB blowup (added 10/2010). In an important new book entitled Jefferson and the Indians: The Tragic Fate of the First Americans, Anthony F.C. Wallace, University Professor of Anthropology, Emeritus, at the University of Pennsylvania, notes that in 1803, President Thomas Jefferson was impressed by William Lytle's early maps of the East Fork and Milford Works, and requested more information about "Those works of Antiquity" (Wallace 1999, p. 139 and n. 18). Wallace includes the photograph of the more detailed 1823 Corps of Engineers map presented above (pp. 140-1). Jefferson's Presidential interest in these specific earthworks may explain why the Corps of Engineers would have taken the trouble in 1823 to map structures that had no conceivable contemporary military value. The fact that the 1823 map depicts precisely those earthworks surveyed by Lytle c. 1803 strongly indicates that there was a more than coincidental link between the two surveys. Roberdeau's 1823 map is the ultimate source of Panel 2B of Plate 34 of Squier and Davis's 1848 Ancient Monuments of the Mississippi Valley. In 1894, Cyrus Thomas, who was unaware of this primary source, dismissed the Squier and Davis diagram as "largely imaginary." In 1902, Gerard Fowke likewise indicated that the "interior arrangement" induced "some scepticism as to the accuracy of the drawings." Fowke rotated the Squier and Davis illustration 90 degrees, and nicknamed the structure the "Gridiron". Thomas and Fowke did not indicate precisely what it was about the East Fork Works that they found so questionable. Subsequently, however, David Berry of Columbus, Ohio has noted that the structure inside the walls looks remarkably like the nine-branched lampstand or menorah used to celebrate the Jewish festival of Hanukkah (or Hanukah, or Channukah, etc). In Israel today, this Hanukkah menorah is called a hanukkiah (or hanukiah, or channukiah, etc), to differentiate it from the seven-branched temple menorah, a more ancient symbol of Judaism. Eight of the nine lamps of the hanukkiah represent the eight days an oil lamp is supposed to have miraculously burned, despite the fact that it was filled by a jar that had only enough oil for one day, after an historical seige of Jerusalem was lifted in 165 B.C. by Judah Maccabbee. The ninth lamp, the shammes or "servant," traditionally stands either higher than or aside from the other eight, and is used to light the others on the eight days of Hanukkah. It should be noted that the upper portion of the outer structure of the East Fork Works bears a curious resemblance to an ancient oil lamp. 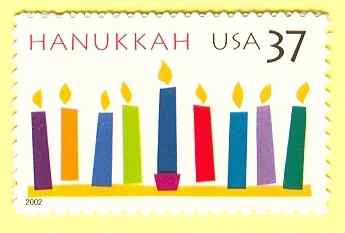 The original oil lamps of the hanukkiah are now commonly replaced by candles, as in the U.S. postage stamp to the right. Squier and Davis obtained their information from an intermediate, secondary source published in French by the American geographer David Baillie Warden (1834). They were unaware of Roberdeau's original map. This primary source demonstrates that, despite the objections of Thomas and Fowke, Squier and Davis did faithfully depict the earthworks themselves. However, it also shows that they and Warden added terrain features to Roberdeau's original map that may in fact be imaginary. Traces of the mound's outline might still be visible from the air, if a concerted search for it were made. The "Gridiron" name for the structure indicates, if nothing else, that Fowke had more interest in football than in ancient history. The bottom and left sides of the East Fork Works were originally labeled "200 Feet", but this is impossibly small given that the vertical "candle sticks" of the "menorah" are each labeled as being "66 Ft" apart, for a total width of 528 feet between the centers of the two outside "candle sticks." Someone later added an additional zero to each of the 200's, so that they now read 2000 Feet. This would correspond well to the scale at the bottom of the left panel, but it is not clear that this was intended to apply to both panels. Furthermore, it would mean that the "menorah" and the outer walls must have been drawn on a very different scale, even though Lytle's map shows them in essentially the same proportion. If the "menorah" is correctly labeled and the outer walls are on the same scale, the base would be about 902 feet long, measured center to center and including the small redoubt. In 2006, Frank Otto resolved this discrepancy of scale by proposing that the map was made by a draftsman back in Washington who was working from field notes that gave the length of the left and bottom walls as 900 feet, but misread the 9s as 2s, as is sometimes easy to do. The Milford works may then have simply been turned so as to fit the largest sheet of paper that was available. The East Fork Works, drawn to a different scale and oriented "upside up" with no necessary relation to north, but with a fancy caption that applies to both works, were then attached to make a single map. For further details, see McCulloch (1996) , now available online. If you have a fast modem, click here for a blowup of the East Fork works (503 KB) . For maximum field of view, enlarge your window to full screen. If you are using Netscape, you might want to use the OPTIONS menu to deselect SHOW TOOLBAR, SHOW DIRECTORY BUTTONS, and/or SHOW LOCATION. If you deselect the TOOLBAR, you can still return to this screen by selecting GO/BACK. The left portion of the full map, displayed above, represents the Milford Group, also depicted in Panels 1 and 2a of Plate 34 in Squier and Davis. Although north is not indicated, it must be about 70 degrees counterclockwise from the top for this portion of the map in order to place the East Milford Works (the smaller square and irregular circle) in their known orientation. The principal river is identified as the Little Miami, and the river joining it at the bottom is identified as its East Fork. This primary source demonstrates that Squier and Davis drew the extension and "wing" to the Milford Works on much too small a scale. The connecting circle must in fact have been on top of the high knoll in the center of Milford, and the "wing" must have extended into south Milford. They also detached the West Milford Works from the plan, and somehow inverted the original diagram in mirror image. For further discussion, see McCulloch (1996). Click here for a blowup (486 kb) of the Milford Group . McCulloch, J. Huston, "Ohio's 'Hanukkiah Mound'" , Ancient American, Vol. 3, # 14 [Sept/Oct 1996], pp. 28-37. Click on title for online PDF. Squier, Ephraim G., and Edwin H. Davis, Ancient Monuments of the Mississippi Valley: Comprising the Results of Extensive original Surveys and Explorations. Smithsonian Contributions to Knowledge, Vol. 1. Smithsonian Institution, Washington, 1848. Wallace, Anthony F.C., Jefferson and the Indians: The Tragic Fate of the First Americans, Harvard University Press, 1999. Williamson, Hugh, Observations on the Climate in Different Parts of America, 1811. Up to Archaeological Outliers Page . This page received 2548 visits, 11/15/04 - 12/26/05. Annoying free hitcounter removed, 12/26/05.